_____________ (your name) has been employed at ____________ (your place of employment) as a human resources administrator for _____ (number) years. _________ (your name) served as chief spokesperson and representative for ______________ (name of company, business or organization), and built bridges with ______________, _____________, and ______________ (connections formed, e.g. the community; universities; business leaders) to enhance awareness of company initiatives. ______________(your name) earned his/her __________ (type of qualification e.g. degree, diploma, certificate) from __________ (name of institution/college/university) in ____________(location of institution/college/university). She/He is a __________ (any other designations you hold) and is also certified in _______________ from ______________. Human Resources people need to have an understanding of and ability to deal with sensitive information, such as HR professionals resumes, background checks, federal forms, union issues, performance evaluations, and many other documents that contain sensitive material. You’ll want to stress that you know how to process and handle these issues in accordance with policies and regulations. In terms of confidentiality, you have as heavy a responsibility as a doctor, attorney, or accountant. HR staff often have to deal with people at a very low ebb in their lives—when they’re being turned down for a job or dismissed from the one they have. There is no easy way to tell someone that he or she is not going to “make it” at a company. In your bio, you should demonstrate that you have the ability to stay calm and professional when others are upset. _________ (your name) lives in _________ (city) with his/her (wife, husband, partner) ________ (OPTIONAL: name of significant other) and their _______ (number) _______ (children, cats, dogs). When _________ (your name) is not working, he/she likes to _________ (your hobbies). _______ (your name) can be reached at _______ (your business contact information). Need a more in-depth bio? In a hurry? 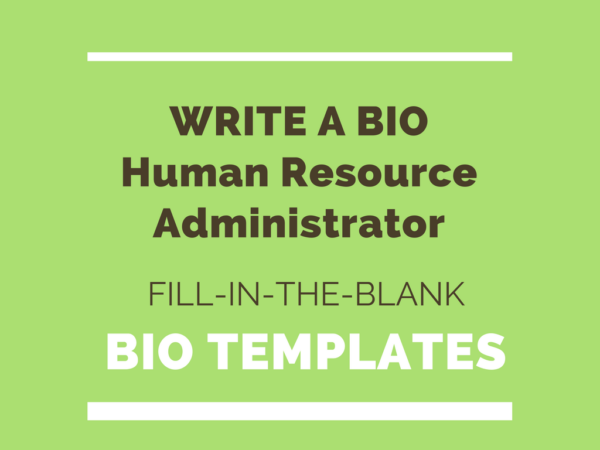 If so, go here to get a professionally written full-length “fill-in-the-blanks” bio template for a Human Resources professional.